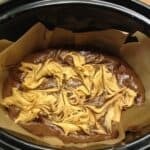 Bake these tasty brownies with a peanut butter swirl in your crockpot! Whisk the light brown sugar and eggs together for 3-5 minutes using an electric mixer, until it looks thick and creamy. Sieve in the flour and again fold in gently until completely incorporated, but do not overmix. Mix the butter, peanut butter and icing sugar together in a small bowl, until smooth. Use a spoon to dollop it on top of the brownie batter. Swirl it together with the brownie batter with a knife. Cook on high for 2-3 hours until just set in the centre. Allow to cool completely before using the baking paper to remove from the slow cooker. Note: Timings depend on your slow cooker. Check after an hour if you have a slow cooker that cooks fast (e.g. a sear and stew). If you have a slow one like me it could take 2-3 hours.